Raised by her grandmother in Stamps, Arkansas for five years and then returned to her mother, where she was raped by her mother's boyfriend. After journalism work in Africa, Angelou became nationally famous with her memoir I Know Why the Caged Bird Sings. She delivered a poem at Bill Clinton's January 1993 inaugural celebration. 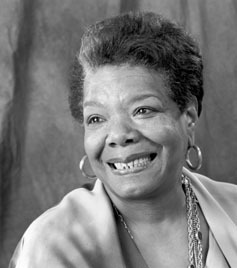 Since 1981 Angelou is a lifetime Professor of American Studies at Wake Forest University in Winston-Salem, North Carolina.